Moteur complet et bonne compression. Réservoir non percer. vous achetez ce qui correspond aux photos. STARTER BOX SPM. Sold without battery. Je vends un set complet en parfait état du buggy Kyosho Mini Z Optima avec de nombreuses pièces en options. Toutes les pièces d'origine sont présentes, ainsi que de nombreuses options visibles sur les photos. 1 ZD Racing M1.0 14T pignon moteur à engrenages. 1 ZD Racing M1.0 15T pignon moteur à engrenages. 1 ZD Racing M1.0 16T pignon moteur à engrenages. 1 ZD Racing M1.0 17T pignon moteur à engrenages. 1 SURPASS HOBBY M1 18T Pignon Moteur Engrenage. 1 SURPASS HOBBY M1 19T Pignon Moteur Engrenage. 1 SURPASS HOBBY M1 19T Pinion Motor Gear. 17T 18T 19T pignon moteur engrenages combo. Construction en métal durable pour une performance durable. Condition is Used. An y qu es ti on s pl ea se a sk. Infact your biggest challenge will be which version to choose from the four different editions available. The tub chassis design can accommodate the use of either a rear motor or mid-motor set-up depending on the vehicle. Voitures 1/10 HSP. NINCO BUGGY BLASTER XB10. 1/8 RC Buggy Wheels & Tyres Set (4). Superb set of Wheels & Tyres(not glued). Features: 1. This is a set of 1/10 Scale Off Road Buggy Tires 2. The tires is with foam insert 3. Tires is made of high quality rubber 4. 1.9" Wheel rim is made of high quality Plastic 5. Light weight, easy to carry. Description: Ideal for RC off road car Specification: Tires Model: 4020 Material: Rubber Diameter: 110mm/ 4.33in Width: 40mm/ 1.57in . Features: Powerful motor enables the car speed up to 45km/h. Shock Absorber: 4WD independent suspension and anti-collision design make the car run through the rough road easily. 2.4G Remote Control Transmission: with strong anti-interference ability, supports far controlling distance and support multiple high-speed cars at the same time. This RC car is totally waterproof,but if you run it in the salt water,it will get rusty..
Ansmann, 211000212, 211000213. Composition du lot . Features: 1. This is a set of 1/10 Scale Off Road Buggy Tires 2. Tire material is rubber, Wheel rim material is plastic 3. Tires are very soft, durable. 4. V Hole, fashion element. 5. Included sponge inserts . Description: Ideal for RC off road car Specification: Tire Material: Rubber; Wheel Rim Material : Plastic Color: Black. 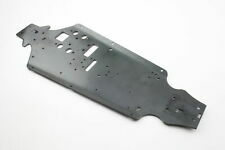 Chassis alu de la STORM PIRATE de chez T2M avec diverses les pièces (l'ensemble présenter en photo est neuf). Chassis alu avec cellule avant et différentiel. Aileron arrière. Servo Savox SC-0252 et sauve servo. 8/ 2 accus réception 6v un en 5000 Mah et un en 3000 Mah. 7/installation d'un kit coupure moteur à distance. Specification: .28 RC exhaust engine Cublic Capacity: 4.57cc Bore: 18.5mm Stroke: 17.0mm RPM: 28000 rpm Power: 3.6 hp Weight: 420g Suitable for RC Off-Road Buggy Truck Package: 1x 1/8 RC Nitro SH-28 engine with Pull Starter (Blue) Marque Sans marque partie moteurs Pour Type de véhicule boguet Source d’énergie Nitro échelle 1:8 NPP Ne s’applique pas UPC Ne s’applique pas Brand Unbranded MPN Does not apply EAN Non applicable. Model MP9 TKI4. Type Buggy. UPC Does not apply. MPN Does Not Apply. MPN TLR04007 TLR242025. Type Buggy. Included Everything Pictured. UPC Does not apply. Big Bore Shock Set 97mm (2). Boost the performance of your 1/8th scale buggy with the all-new Big Bore Shocks from Hot Bodies! A full set of mounting hardware is included to bolt these puppies right onto any Lightning or other 1/8th rallycross buggy! Tamiya Damper Bushing/Bushes (8 Pcs. )., Part No's. 58452: Sand Scorcher (2010). 84164: RTR Sand Scorcher 2010. 58441: Buggy Champ. 84163: RTR Buggy Champ 2009. 84187: Buggy Champ 2009 Silver Ed. - Silver Edition. MPN TLR04007 TLR240010. Type Buggy. Included Everything Pictured. UPC Does not apply. Model MBX7. Type Buggy. UPC Does not apply. MPN Does Not Apply. Type Buggy. Fuel Source Electric. UPC Does not apply. MPN Does Not Apply. Scale 1:10. 4 tres bon etat. 1 passable ou fatigué. Features: 1.Replacement part for 1/10 RC Buggy Car Rear Suspension/ Truck Rear Suspension/ Bigfoot Front Rear Suspension. 2.Easy to install and simple to replace your old one. 3.Fine workmanship with alloy CNC material ensures the longevity of the product 4.Allow your car have a high performance. 5.High spring elasticity ensures the damping effect. Description：. MPN TLR04007 TLR242024. Type Buggy. Model D817. Type Buggy. Fuel Source Nitro. UPC Does not apply. MPN Does Not Apply. MPN TLR04007 TLR255013. Type Buggy. Included Everything Pictured. UPC Does not apply. Gewicht komplett ca. 630 Gramm. Luftfilter, Seilzugstarter, Tuning Resorohr. MPN TLR04007 TLR241032. Type Buggy. UPC Does not apply. MPN TLR04007 TLR244057. Type Buggy. UPC does not apply. MPN 204035. Model E817. Type Buggy. Spécification: - Modèle: HSP 80141. Moteur de Voiture Camion RC pour 1/1. Mini 4CH Télécommande RC Racing Ca. Mini 4CH Radio Télécommande RC Rac. 1:58 haute vitesse RC modèle voitur. enfants médecin infirmière kit fai. Features: 1.Replacement?part?for?1/10 RC Buggy Car Rear Suspension/ Truck Rear Suspension/ Bigfoot Front Rear Suspension. 2.Easy?to?install?and?simple?to?replace?your?old one. 3.Fine?workmanship?with alloy CNC material ensures?the?longevity?of?the?product 4.Allow?your car have a high performance. 5.High spring elasticity ensures the damping effect. Description：. MPN TLR04007 TLR244039. Type Buggy. MPN TLR04007 TLR241051. Type Buggy. Vendre dans la catégorie Véhicules RC: pièces, access.